You only live once, so why waste your time wearing a boring bathrobe when you could have a Star Wars Bathrobe! This is a super cool gift idea for any Star Wars fan or a neat way to feel like you are in costume even when lounging around. Live the Star Wars dream and feel like a Stormtrooper whnever you like! This is a very well made cotton robe that is long wearing and comfortable. A bathrobe that combines coolness with quality. Really what else could you need? 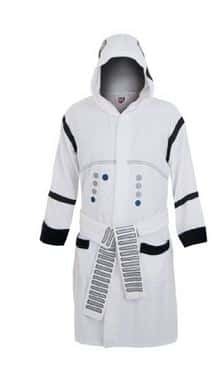 If you like the idea of a Star Wars robe but would prefer to dress as a different character there are others available. Check out these neat bathrobes as well .. Darth Vader, Jedi and R2_D2. If you are truly a Star Wars fan you may also appreciate this DIY Han Solo Door, very cool!